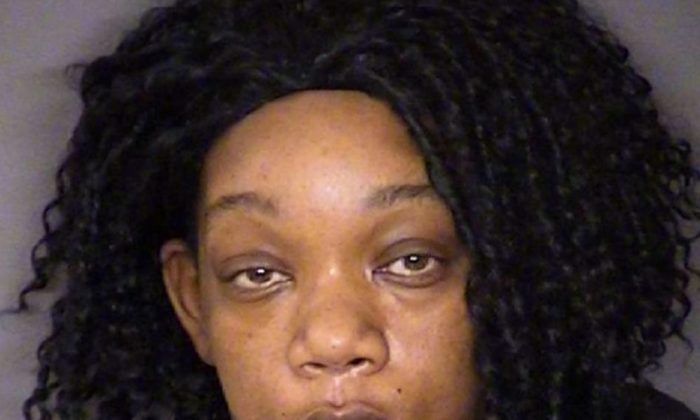 The mother of two children who were found chained up outside a San Antonio home was found in California, according to reports on Tuesday. Police had been searching for the unnamed mother since Friday when a neighbor called police after they heard cries of a 2-year-old boy. They found a 2-year-old boy chained to the ground and a 3-year-old girl tied to a door with a dog leash. Phillips, 34, was arrested and taken into custody Friday after returning home. She remains in jail on $150,000 bond after she was charged with two counts of injury to a child. Phillips’ six children—who are between the ages of 10 months and 10 years—were found unattended inside the home. The two children found outside the house weren’t her children, leading investigators to search for their parents. The Bexar County Sheriff’s Office told the San Antonio Express that the unidentified mother had been found more than 1,000 miles away in California over the weekend. The eight kids who were found at Phillips’ home are now in custody of Child Protective Services, after the two were left outside and found dehydrated with bruises and the 3-year-old had a fractured arm. Officials in Bexar County confirmed to KEN5 on Monday that in addition to eight children in the home, Phillips was pregnant with a seventh child. “We’re doing whatever we need to do so that they’re taken care of,” Walker said. Child Protective Services spokeswoman Mary Walker said the two children are still recovering in the hospital on Saturday. The girl had been in intensive care.